Wow, May is finished for 2013. Time is really flying for me. Sigh! 1. Border or sandwich one of the Key Hole quilts. Have to decide whether it gets borders or quilted as is. I chose the Summer Batik Key Hole top and no border on this one. 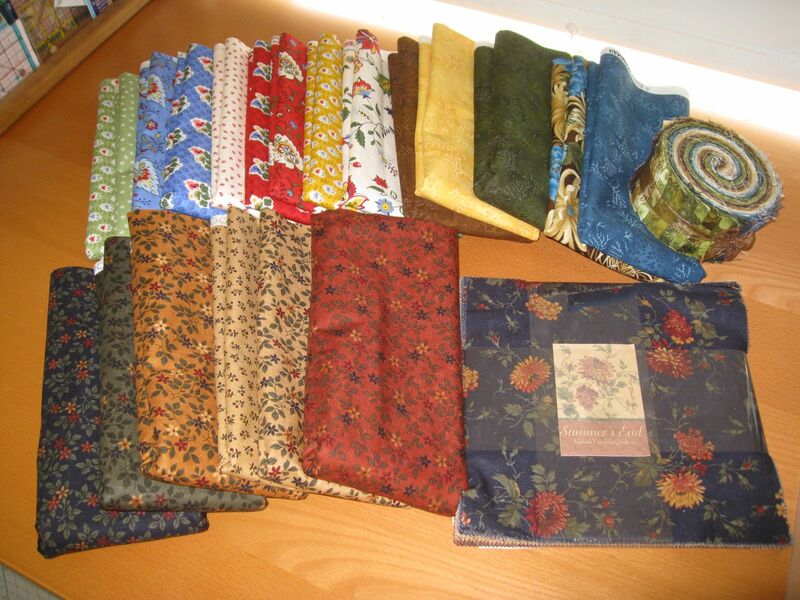 It’s now backed with some yellow yardage from stash and sandwiched ready for quilting this summer. 2. Quilt either Monster Bash or Jared Takes a Wife, or both. Jared Takes a Wife is quilted. 3. Finish the Pineapple Blossom blocks. All 20 Pineapple Blossom blocks are finished. 4. Get Part 1 and 2 Lazy Sunday pieces done before the next issue is released. Lazy Sunday is up to date and I’m ready to start on Part 3. 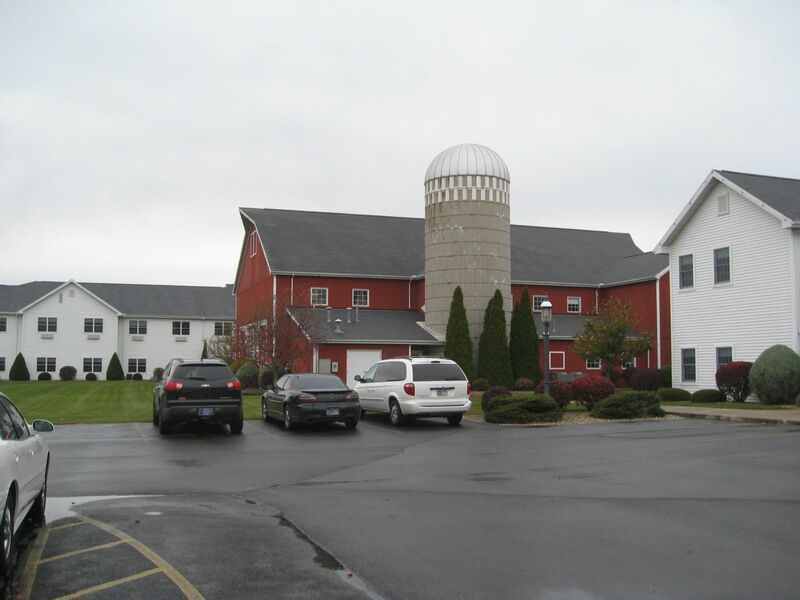 Linking up to Judy’s Getting it Done post. Sandwich Monster Bash (Need to choose and make a backing first.) Done. 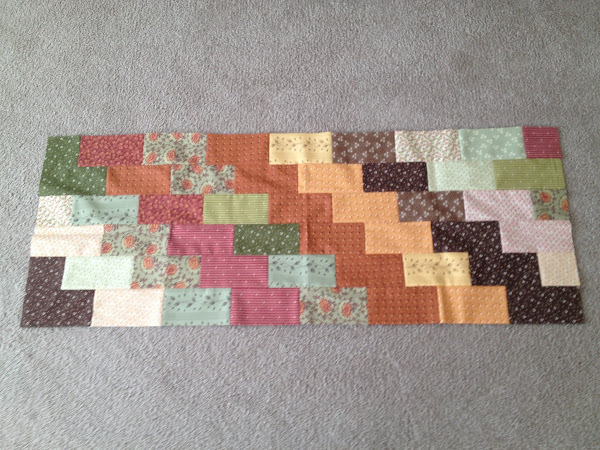 Quilt Easy Street (Sandwiched and ready to go) Done. 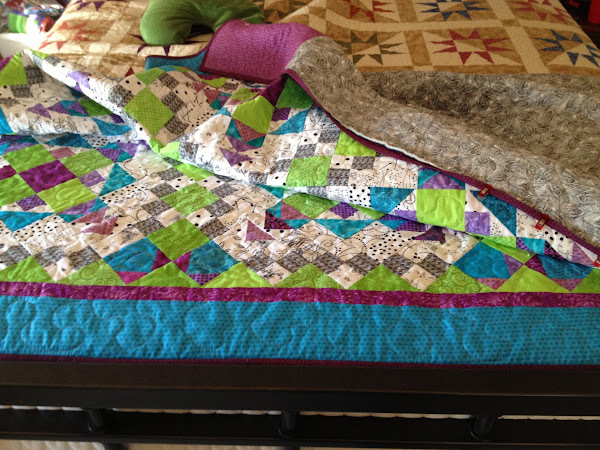 It’s quilted and I’ve got about three feet of binding to sew down. It will be finished today since it’s my April quilt for a UFO Challenge at Heather’s blog. 3. Roll Roll Cotton Boll Blue. (Sandwiched and ready to go) Done. 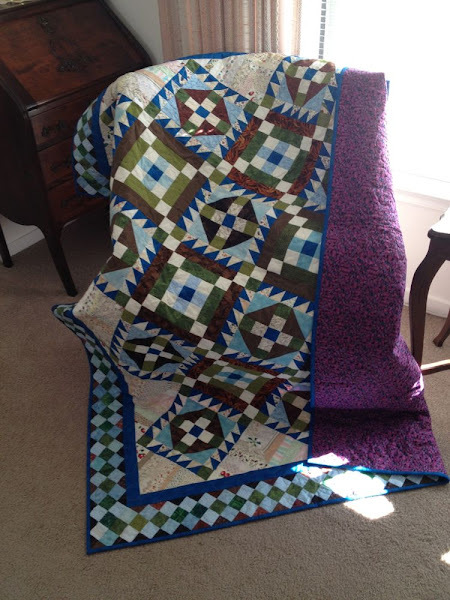 This quilt is now finished and waiting to be given to my good friend Kipp. Not so good here. Didn’t even take the top off the hangar. Sigh! Goes on next months list. Got the borders on and sandwiched Jared Takes a Wife, finally. Started a Pineapple Blossom in all Blues for my grandson. Got out an old UFO (with no name) and started sewing the 3.5” x 6.5” cut pieces together in a brick pattern for a charity quilt. This one has no particular plan. I’m winging it. Border or sandwich one of the Key Hole quilts. 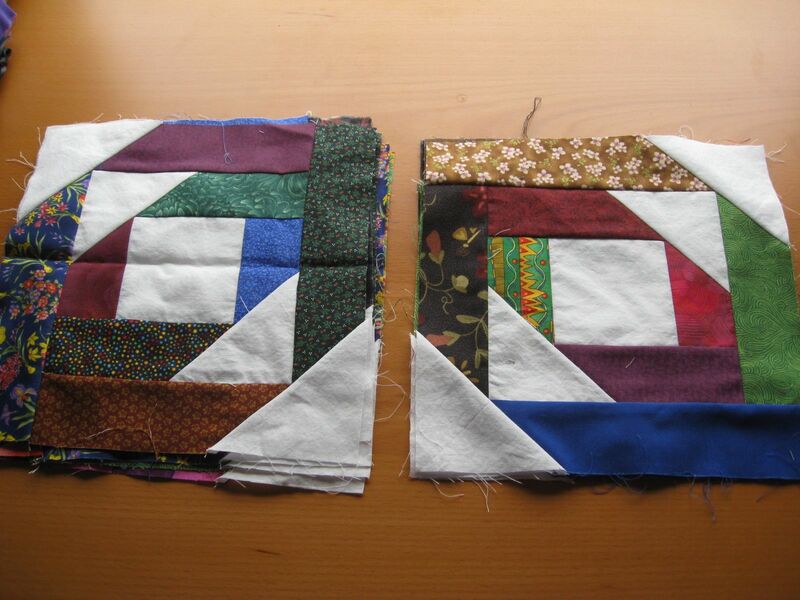 Have to decide whether it gets borders or quilted as is. Quilt either Monster Bash or Jared Takes a Wife, or both. Finish the Pineapple Blossom blocks. Get Part 1 and 2 Lazy Sunday pieces done before the next issue is released. That’s it for me. Go see how everyone else is doing here at Judy’ blog. On my Design Wall today are the same pieces for Lazy Sunday as last week. No progress there. But new on the wall are the Blue scrappy blocks I’ve started for Bonnie’s Pineapple Blossom for my grandson. He wants a Blue and White quilt "with no turquoise please". 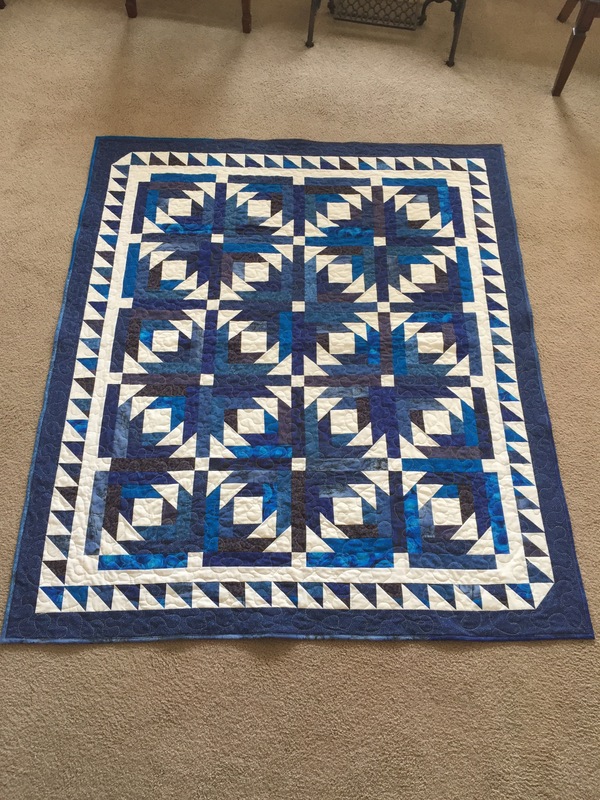 So I cut some strips from every medium to dark blue in my stash for this one. 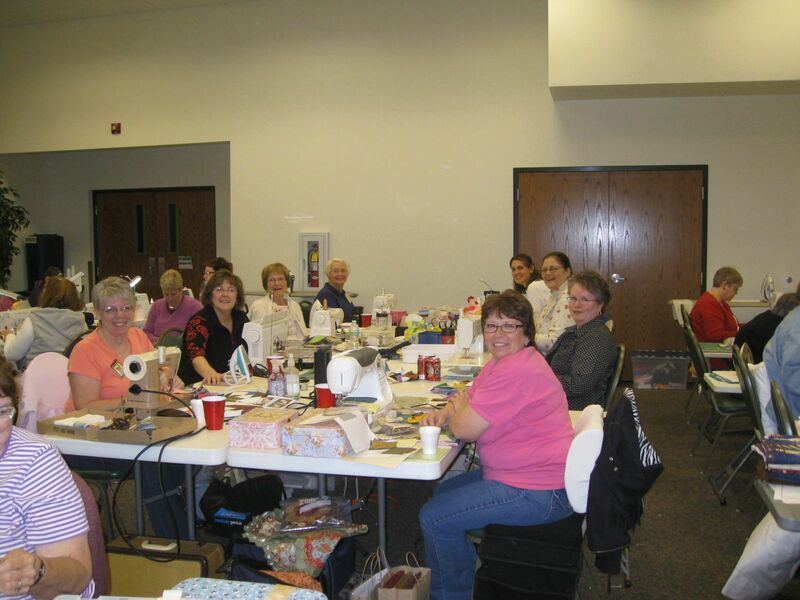 Linking up to Judy’s Design Wall Monday. Check out what everyone else is up to. Here’s what is on my Design Wall today. I started these blocks at the Shipshewana Retreat in October and pulled them out yesterday as some mindless sewing to do during the Super Bowl. I love how these have turned out. The pattern is Bonnie’s Pineapple Blossom. I have 25 blocks done even though only 20 are on my wall. 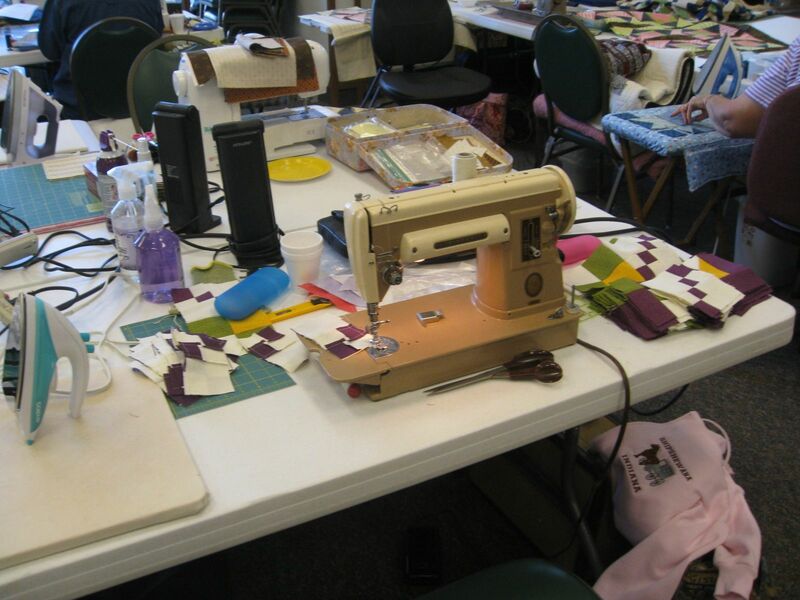 In other news, I managed to get my Strip Twist quilted on Saturday. But, I broke 4 needles and the thread broke at least a dozen times. Not sure if it is my machine (Sapphire 850) or the thread combination or what. Very frustrating but I got it done and it looks great. To view more Design Walls, click here.